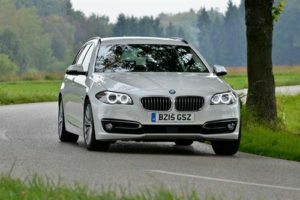 Looking for an objective review of the BMW 5 Series Touring? OSV gives has got you covered, from engines to sweet lease deals. The new BMW 5 Series Touring is a long estate car that just keeps on growing. We don’t know what BMW are feeding it, but it’s working – it’s now absolutely huge and can easily accommodate your family and luggage. It’s comfy, modern and practical. Importantly, it’s also about as desirable as cars like these get. When it was first launched, its huge boot caught all the attention. Thankfully, there is more to it than gargantuan luggage space. If you need a well-equipped, solidly-built, good-looking family car that drives well, it’s well worth a test drive. OSV takes a closer look at what it’s all about with our BMW 5 Series Touring review. Estate cars aren’t exactly known for their drivability. In fact, most of them are cumbersome and downright awkward (especially to park – don’t get us started). However, this 5 Series isn’t any of those things. It handles with the assuredness of a saloon, and is easily the best handling car of this type – ever. The problem rivals have is somehow meeting this cars high standards, which we don’t think will be at all easy. However, to really get the best out of how this car drives, you’ll need to add the adjustable dampers, which are an optional extra. They boost ride quality and handling. But even without them, you’ve got a refined and very pleasant-to-drive large car on your hands. In terms of the diesel engines, there is something to suit everyone. A 2.0-litre 518d Touring sits at the bottom of the range. It’s not the most performative engine, and it lacks punch. But its economical and affordable to buy. The 535d model is powered by an ageing 3.0-litre diesel. There is still some fight in this six-cylinder warrior yet, and it’s got enough power in its tank to thrust you from a standstill to 62mph in an impressive 5.4 seconds. There are a few petrol engines to choose from, starting out with a 242bhp power plant that powers the 528i model. We like the turbocharged 3.0-litre 302bhp engine the best, though. It can do 0-62 in 5.8 seconds, and is mostly responsive – just mind you don’t get stuck in low revs. However, we reckon you could easily get away with going for an entry-level engine. They’ve got enough power to haul this car along, and unless you love to drive fast, they make a lot of sense. The dashboard is slick and minimal, and suits the car’s premium image. The cabin is composed largely of top-quality materials, while fit and finish is excellent. And when you check out the intuitive iDrive infotainment system, it’s easy to see that this is just as good as anything Mercedes or Audi could come up with. Head-up display is disappointingly only available as an extra, but it’s worth adding as it makes it so much easier and safer to track your sat nav, current speed and more. It’s an impressively practical interior. The boot measures 560-litres, and this can be extended to 1,670 by folding down the rear seats. However, as big as this is, it’s not the biggest in the class, and the Mercedes E-Class Estate can offer more boot space. Still, 560-litres will be enough for most people. Moreover, this is the widest boot floor in this sector, while a split-folding tail gate and an unde floor storage area enhance usability. 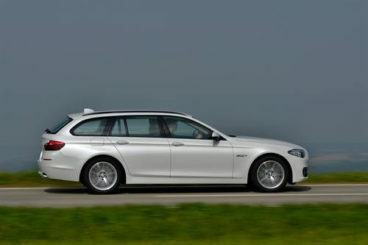 As you can probably tell from the pictures, the BMW 5 Series Touring Estate sits on a pretty lengthy wheelbase. This means there is a good amount of legroom, both upfront and in the rear. The only passenger who might feel a bit uncomfortable is anyone unlucky enough to sit in the middle, as they’ll have to cope with a rather big central tunnel. Headroom is good all around, and the steering wheel and driver’s seat offer plenty of adjustment. 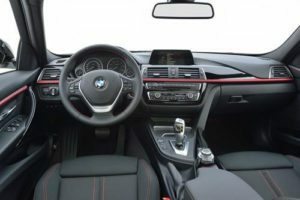 Standard equipment is excellent across the range and includes Bluetooth connectivity, leather seats, cruise and climate control, automatic windscreen wipers and lights, and front and rear parking sensors. There is still plenty to choose from the list of optional extras, however. Be careful, as you could easily ramp up the original listing price! Our recommendations include the upgraded sat nav and stereo system. This is a seriously safe car. It achieved a perfect score of 5/5 from its Euro NCAP crash test, and its safety kit includes traction control, electronic stability control, and 6 airbags. You’ll have to pay extra for a head-up display. Prices for the new car start out from £33,300 and rise to £51,300. For more information, you can check out our lease deals here. In terms of its running costs, the engines by and large offer a good mix of performance and economy. An active radiator grille helps to keep costs down, as does energy-brake recuperation. The 520d is our top pick if you want an economical but performative car. It emits only 122g/km of CO2, and can return fuel economy of 61.4mpg. The sportier 3.0-litre diesel is a good bet, too, and emits 149g/km of CO2 while returning fuel economy of 50mpg. The petrols aren’t completely a lost cause, with the 528i Touring able to return 44.1mpg while emitting 149g/km of CO2. The engines are brilliantly economical and performative. Whether you want the twin-turbo V8 or the TwinPower Turbo diesel, there’s something for everyone. BMW have employed a number of energy saving measures to keep costs down, and it’s appreciated. This car has just grown and grown. We think it’s slightly unfair that to truly get the best out of the way this car drives you have to pay extra. But hey-ho, this is still a supple ride. You get 560-litres of luggage space, which is good. But rivals have bigger boots, such as the Mercedes E-Class Estate. Let’s see how the car fares against its rivals in the comparison section of our 2017 BMW 5 Series Touring review. 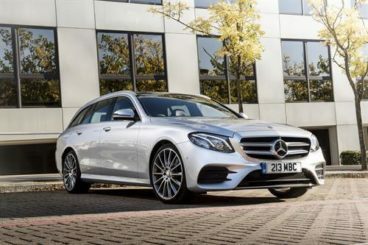 The new Mercedes E-Class Estate boasts an interior that is spacious and luxurious, and it’s also loaded with plenty of advanced technology for the modern family. On the road, the E-Class is reassuringly as relaxed as ever, with Mercedes focusing on comfort rather than sportiness. However, they have improved the cars’ drivability, and it’s a more rewarding proposition than last time. It still can’t compete with the BMW when it comes to out-and-out driving thrills and spills, though. There is too much body lean, and not enough steering wheel feel. Compared to the E-Class Saloon, though, it measures up well. In terms of the engines, the 2.0-litre 192bhp diesel that powers the E220d is proving to be the best-seller. It’s got lots of power, pulls well, and can do 0-62mph in 7.7 seconds. However, the amount of noise it makes does take the shine off it a little. If you want more pace, the 3.0-litre V6 that powers the E350d diesel produces up to 255bhp, and can get you from a standstill to 62mph in 6.0 seconds. There is only one petrol model in the range, and it’s an AMG model. This high performance E43 is powered by a massive 3.0-litre V6 unit that develops almost 400bhp, which is enough to rocket you from a rest to 62 in 4.7 seconds. For an Estate, we’d say that’s unbelievably quick. Mercedes have worked hard to keep emissions down this time around, and overall it’s a green-minded and economical car. The E200d and E220d diesel models can both return fuel economy of 67.3mpg when paired up with the entry-level model, while the latter emits just 109g/km of CO2. If you’ve still got your eye on the AMG E43 model, returns of 32.8mpg are the best it can manage. The E-Class Estate is as comfortable as ever. What we like about it is that, despite Mercedes trying hard to boost driver appeal here, they haven’t forgotten about the passengers. The suspension is good and makes for a smooth experience even on the UK’s poorest surfaces, and the 17” alloys are worth sticking to for maximum ride quality. The AMG model adds bigger wheels, which does forsake comfort, but that’s to be expected. The interior design is breathtaking, and you’ll find it hard to believe you’re seated in an Estate. Attention to detail is second to none, the instrument display is easy to read, while the optional twin-widescreen layout is easy to operate and worth adding. There is also plenty of space in here. Passengers in the rear should be more than happy with the amount of room they have, with the longer roofline ensuring that head room is better than last time. Storage spaces include a sizeable glove box on the passengers side and deep door pockets. The boot, meanwhile, measures 640-litres, which makes it bigger than the one in the Volvo estate. It trumps the BMW’ by almost 100-litres, and can be extended to 1,820 by folding down the rear seats. The new Audi A6 Avant is a huge exec estate that blends practicality with performance and economy for the perfect recipe. On the road, the A6 Estate s quiet, refined and assured. It’s at its best on the motorway, but take it onto twisting roads and it won’t feel as entertaining as the BMW. Like the Mercedes, its steering lacks feedback and Audi have been unable to conjure an agile estate car. The diesel engines will be the most popular with buyers. A 2.0-litre TDI Ultra opens up the range, and is our top pick. It can do 0-62 in 8.5 seconds if you add the optional 7-speed automatic transmission, before maxing out at 140mph. It’s the slowest of the engines, but it has more than enough pulling power and can overtake safely and with ease. There are no petrol models to choose from, which means running costs are generally good. 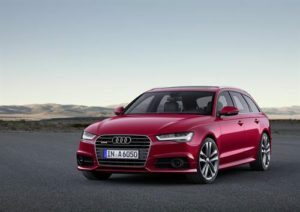 The only time you will need to dig deep in your pockets pretty constantly is if you go for the Audi S6, which averages fuel economy returns of 30mpg. Before you get scared off completely, check out the figures managed by the 2.0-litre TDI Ultra diesel – 64mpg. We can’t find a fault with the Audi’s interior. The materials are all of a high-quality, the controls are within easy reach, while the MMI control system is intuitive and controls most of the A6’s functions. In terms of practicality, it’s superb. It measures roughly the same length as the BMW, but is easier to park, thanks to the brand’s parking system, which is an optional extra. Two adults will be perfectly fine in the back, where headroom is actually better than in the saloon variant. The boot is on par with the BMW’s, measuring 565-litres. You can easily extend this to 1,680-litres by folding down the split-folding rear seats. People who love to criticise might point out that the E-Class Estate has a bigger boot. But a smaller boot aside this large BMW is a class act. It handles superbly, has good ride quality, and its engines are powerful yet affordable. It’s also absolutely massive. While this can make it tricky to park, it provides excellent interior space for everyone, while its 560-litre boot – though not as big as some rivals – will be more than enough for most. All in all, the new BMW 5 Series Touring Estate oozes quality.